My last trading analysis covered AUDUSD. 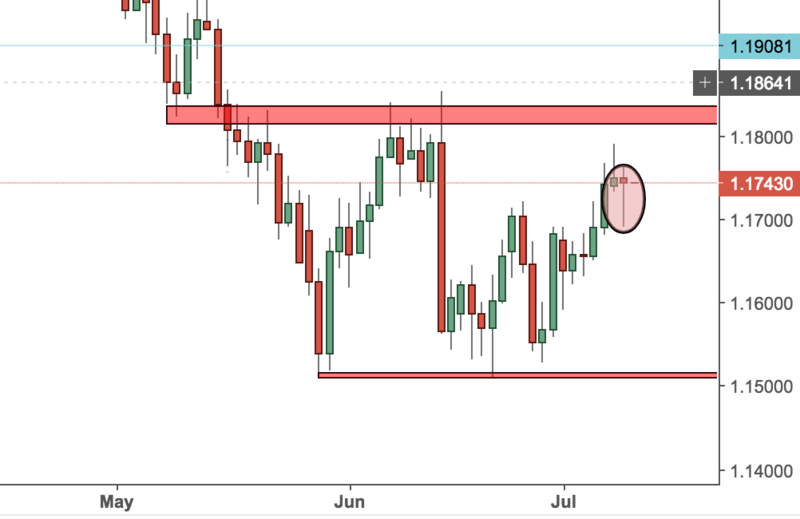 There was three-candle bullish engulfing pattern and price went higher but there was no price actin indication from the 4H chart. Then, price went lower and formed an inside bar on the daily chart. At the same time, there was pin bar on the 4 Hour chart and bulls followed it. I wrote about that on my Twitter page. Today, I am looking at EURUSD. It looks like there is a pin bar on the daily chart. Even though that bodes well for the bulls, it looks like there is a resistance level very close as indicated by the chart. That does not look extremely bullish for me and as you are probably aware of my trading course, price action setups that occur in the middle of a price range are not as attractive as the ones around the major levels. Therefore, I am thinking of skipping this opportunity and looking for the next one. Until then- be patient and do not overtrade!